In this article by GM Damian Lemos, he looks at one of the mistakes club players make all the time is reacting to what their opponent has just played. He advises that while you should try and understand what your opponent is up to, you shouldn’t let him/her dictate play. In the image above, Emanuel Lasker (Black) has just played17…Qb6 avoiding the exchange of Queens. What would you play here? Many players choose 18.Qe2, anticipating one of the rooks coming to the d-file. This is a case of reacting to our opponent’s move. Instead of worrying about what Black wants to do next, look at what you can do right now. Alekhine played 18.Qd6! I imagine you would have no problem finding that move – but what’s so good about it? Well, it gains time by attacking the e5 knight. Black must do something about the threat then it’s our turn again. 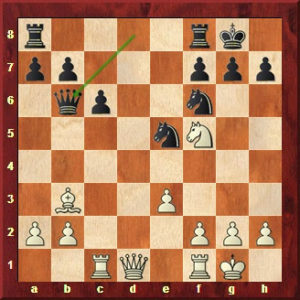 When the knight moves, White can move the Queen to g3 and attack the King. Also, we’ve cleared d1 for one of our rooks. In the game, Alekhine’s attack just flowed from here. In fact, Lasker’s 17…Qb6 was probably the losing move. Remember: don’t just react to what your opponent is doing, focus on what you can do.